← Kristof: Islamophobes are on the loose. 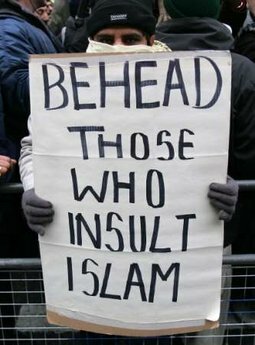 The Muslims do not tolerate anyone who disagrees with them. Omar Ahmed subsequently denied making such a statement. However, the reporter says she only printed what he was recorded as saying. The newspaper stands by its article to this date. Come join thousands of your fellow citizens to demonstrate in front of the Ground Zero mosque site. Let the world know your feelings on this monument to Islam two blocks from the 911 mass murder site. New York City: Saturday, September 11, 3 pm. Park Place, between Church St. and West Broadway. No signs will be permitted. Bring American flags only. This entry was posted in American politics, Christian, Ground Zero Mosque, Iran, Islam, Islam and the US, Israel, Jewish, Judaism, Media, Obama, Terrrorism and tagged cair, council american islamic relations, daniel pipes, ground zero mosque, islam, jihad, Koran, liberal press, media and islam, omar ahmad, omar ahmed, pam geller, robert spencer, san ramon valley herald. Bookmark the permalink. 3 Responses to Islam only accepted religion. I want to know why they cover their faces. At a Green Bay Packers game, I can see it. But just putzing around, marching to and fro with “Kill Whitey” signs and waiting for a camera? Are they trying to look fierce like the Lone Ranger or are they afraid? Afraid of what? Moderate Muslims seeing who they are and getting upset? Grow a beard, not to mention other things. And another thing. You want ME to become a Mohammedan? Fine. Go to East LA and convert the Mexicans. Yes, go right into the old hood carrying those signs, and deface a picture of the Our Lady de Guadalupe while you’ve got the crayons out. Play games with them what don’t do PC. Si.